In 2015, there was a change in political control in Cheshire West and Chester. Between October 2015 and January 2016, the New Labour administration embarked on an extensive 12-week consultation with local people, with more than 1,800 people offering their views on the issues and priorities that mattered to them. This consultation included a broad range of methods and resulted in a new 2016-20 Council Plan. We began by working closely with our 125 Streetscene colleagues to co-produce a Streetscene Culture Plan. Given the geographical spread and variety of hours worked across the service, a range of methods were used to establish the current issues and areas for improvement from the team’s perspective – including; one-to-ones, focus groups, team meetings and conversations during the course of people’s work day. It was also important to demonstrate that we were listening right from the start – and not unnecessarily delay any positive changes that we were able to make straight away, which were well received. In relation to Objective 1 – Embedding Thrive – 80% of Streetscene staff (iiP survey) agreed that ‘the Council empowered and involved people,’ while 76% of staff agreed that they were ‘living the organisation’s values and behaviours;’ more positive than many other areas of the Council. Feedback throughout the transformation programme was a view that similar efforts to embed culture change historically had failed, due to operational demands taking over – and resulting in an increased level of cynicism. Key to the success outlined above was our commitment to maintaining momentum; not delaying any positive changes which could be made straight away; and embedding Thrive values and continuous improvement through the Streetscene Culture Plan as the new ‘business as usual,’ rather than a one-off event. We held monthly culture checkpoint meetings to chart progress, and developed them into a monthly culture steering group, which still occur today. In addition, we were careful to tailor our approach to different staff members, opening up clear processes for ongoing two-way communication. Central to the immediate and significant increase in ‘Exceeding’ appraisal ratings was our engagement with Streetscene management and staff to develop and appropriate, consistent and clear framework for monitoring and grading performance; all of which was successful in embedding our values and positively influencing the culture across one of our most disparate and geographical challenging council services. HR worked with the service to develop a matrix explaining exactly what is meant in each job role to be performing well, exceeds or outstanding. This, together with an explanation of our THRIVE values, was pulled into a pocket-sized guide and distributed to all operatives at depots across the borough – giving staff the opportunity to prepare evidence ahead of their mid and end of year appraisals. 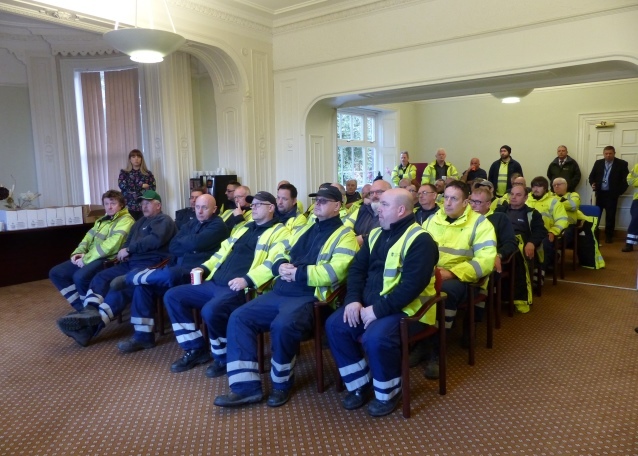 In addition, Performance Management training sessions were held with all Supervisors to ensure they were undertaking the appraisals correctly and consistently. This has had a positive effect on residents across the borough, with the creation of a high performing culture resulting in improved productivity and quality of work by the Streetscene Service; and characterised not only in engagement and appraisal increases, but also by a reduction in the number of related MP queries (90 in 2016, 71 in 2017). .